Due out tomorrow, Tuesday, September 18th, is Dr. Robert Cantu’s most recent writing on brain trauma; more specifically the concussion and how it relates to the ‘kids’. Dr. Cantu is THE expert when it comes to concussions, heck his CV is so expansive it would take up like 7 pages on here. The man knows his stuff; collaborating with Mark Hyman I believe he has written a book that is worth the read for everyone interested in this topic. By writing this book they not only address the concussion issue but the “iceberg below the surface” the youth athletes and their care. Obviously the millions that partake in sport and recreation are not privy to the top of the line medical staffs that the professional and high college athletes have at their disposal. The book begins with the most important topic, in my opinion, “what is a concussion?”, delving into the brain and its physiology. 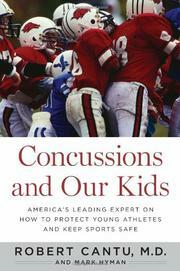 Don’t be scared, it is a well written chapter and explains to the layman how and what we feel determines a concussion. Highlighting that section is the explanation of linear and rotational acceleration and why one is way more important than the other. If you have read here enough you will note that the rotational aspect of the traumatic force to the brain bucket is the most troublesome, Cantu agrees. In this chapter Cantu also discusses the term “rest”, and what we are all trying to convey, especially to the youth. Rest is both physical AND cognitive, meaning not using your brain. The next two chapters deal with collision sports (hockey, football, boxing) and the non-collisions sports (wrestling, soccer, volleyball, basketball, baseball, softball, cheerleading, mixed martial arts, skateboarding and tennis). Through out the remainder of the book there are real-life examples of concussions in sports, using actual cases and events to accentuate his information. Putting a name and sometimes faces (pictures) to the different and often difficult cases makes the reader feel intimate with the subject mater. Although the book points out the sports above, it is important to know that concussions can happen anywhere, any time, including your back yard playing with the neighbors. A hot topic, of sorts, is the baseline testing that is not only trendy but becoming a standard. In the fourth chapter Dr. Cantu discusses this, including the oft cited ImPACT program. I won’t spoil what he thinks about such cognitive testing, but he does offer other examples of baseline testing that can be used. The baseline chapter also brings the opportunity for Dr. Cantu to rehash his hit count proposal (one that we agree with here) as well as other needed topics. This brings me to the first point of contention; at the end of the chapter he discusses products that make “miraculous” claims. While his first target is a headband and I feel deserves the note the other one is the chin strap with a notification device, the Impact Indicator. Full disclaimer I have consulted for Battle Sports, so of course I am going to have an opinion on this. His point being that the chin strap is making faulty claims and that “a kid with concussion symptoms might not be evaluated because a light bulb failed to turn red is disturbing and dangerous.” True, but this product has not nor should it replace the recognition by the athlete or the trained sideline evaluators. Rather this is a tool – just like the cognitive tests earlier in the chapter – that shows promise in identifying potential injuries and could alleviate the athlete from trying to “shake off” a violent collision. Another aspect of this tool, one that I think missed Dr. Cantu, is that in practices or games when there is one athletic trainer (or none in most cases) this product could help with quick identification of proper attention. Following the baseline testing the book turns back to the medical side of things, discussing post concussion syndrome and second impact syndrome. Both of which are results that should and could be avoided with proper management from the beginning of the sequale. The next chapter is on Chronic Traumatic Encephalopathy (CTE) and the research going on – mainly at or near him in Boston. He does a tremendous job of trying to explain that being fearful is not the right response to this degenerative brain disease. Although the list is good, it pales in comparison to the work done by Don and Flo Brady, you can see their list of myths HERE. However, this chapter is well needed for the layperson. Naturally the book leads to what happens after a concussion in the holistic sense, chapter nine. This chapter is mainly stories of actual cases and how people persevered and moved on, sometimes making a sport change or changing an approach. It really does a good job of settling down the audience at this point, which is important for the next chapter is one that will be the hallmark of the book. All points that we agree with here at The Concussion Blog, in fact we have been saying these things for some time. Glad that Dr. Cantu actually is being both honest and forthright in this chapter. Like I said, there is not beating around the bush in this periodical. I will tell you the first response to this will be “what evidence do you have that 14 is the proper age.” My simple response to this is that reducing the exposure to brain trauma for CHILDREN is vital during the development of the brain. It really is common sense; how many times do you slam your hand in the bathroom door? I bet once or none at all because it hurts. Why damage the brain, even at a microscopic level if you don’t have to and still enjoy the benefits of team sports? In the appendices there are check lists and history forms, but I do have the final bone to pick with the “Guidelines for Return to Play After Concussion(s) That Season”. Dr. Cantu was the first in 1986 to give a guideline on RTP, he has since edited and learned things to create his new version. However, he again uses the grading system and even the term “minor” to describe a concussion. Obviously, you know my stance on that and if you don’t remember that I feel that the health care providers understand this nomenclature the general public does not. Thus, terms and grading only muddies the water when dealing with that. Not only do I agree with Dr. Cantu about the clinical evaluation being the ultimate guide I also agree there are cases that would be outside of his guidelines. I think that had he just left out this one appendix this book would have been a home run. Giving the reader the ability to find a loop-hole somewhere, a trace of evidence that they can show a practitioner that they can play the more complex the situation becomes. I have lost count of how many “mild” concussions have been prolonged longer than a week, and I certainly have had my share of “Grade 2 – Moderate” concussions be absolutely perfect in less than a week. I guess this part of the book is up to the person in charge of the management of concussions. The final note is a part in the book, I will have to paraphrase as my 18 month old has stolen the book, where Dr. Cantu lets the reader in on the “dirty little secret” amongst health care providers: most doctors were not and have not had the time to catch up with concussion management. This leads to the elephant in the room, the mismanagement of concussion. It is important to find the right provider that has proper perspective, training and experience with concussions to deal with any brain injury. Overall, I grade this book an A; mainly because of how I feel it will hit its target audience. Not only that the willingness of Dr. Cantu to stand firm on his recommendations going forward for youth sports. I would like to thank Houghton Mifflin Harcourt Publishing Company for providing me an advance copy of this book. Please take the time to get it read. Next Article Ever Wondered About the Adolescent Brain? I have read the book, and it is a good job. I do not subscribe to hit counts as it is difficult to manage. Also coaches, parents and players will game it. Finally, relatively small hits can result in severe injury. No hit count will deal with that. It requires trained clinicians. Regarding Impact, he makes an accurate statement, it is a wonder of marketing. I simply wish they had some science and did not encourage bad clinical behaviors. There are better systems that do not really on marketing hype. CTE is overemphasized. There are many types of brain injuries that are not CTE that are extremely bad. To Cantu’s credit, he touches on some of them. I really appreciated that he did finally say what many have long known, “most medical professionals have no clue about diagnosing or managing the injury.” There are half-dozen MDs, and PhDs that I would refer a complex case to. None are in Pittsburgh and Cantu is one of them. Due note, with this book’s publication the NFL will cut his funding off. I am sure the $30MM that the NFL gave to NIH last week was after Goodell et al. read the book. While BU should not have gotten that much money. It should have gotten a piece. I am sure NIH received the money with the understanding who, how and what the money will be spent on. BU is probably off the prime funding list (likely to only see some crumbs). I have been critical of BU/SLI for over-promoting incomplete science but Cantu to a position. Doing the correct thing has its costs. People just need to use common sense, money has always and will always buy influence. Yes, it’s wonderful that the NFL is funding research, but are we really getting industry funded research that is being washed through a 501(c) to make it appear more legitimate? A little sun light and some healthy skepticism on the part of the public could help ensure that the funds aren’t just allocated to NFL friendly research projects. I haven’t read the entire book yet, but that sentence would seem to indicate that Appendix D was included to provide some historical perspective, rather than as a current RTP guide. I don’t think you’re the only one to criticize him for the inclusion of that chart. Personally, I would like to have the intended purpose clarified.